Researchers studying Parkinson’s disease have long wanted to know how clumps of misfolded proteins damage brain cells and contribute to the disease. Corinne Lasmézas, Ph.D., and her Scripps colleagues believe they have now cracked the case of pα-syn*, a protein clump that is particularly toxic to the cells. Their study (“Pα-syn* mitotoxicity is linked to MAPK activation and involves tau phosphorylation and aggregation at the mitochondria”) published in Neurobiology of Disease shows that pα-syn* causes damage by recruiting certain enzymes and an accomplice to damage cells. The accomplice is the tau protein. “We recently identified a truncated and phosphorylated form of α-synuclein, pα-syn*, as a key neurotoxic α-synuclein species found in cultured neurons, as well as in mouse and Parkinson’s disease patients’ brains. Small pα-syn* aggregates localize to mitochondria and induce mitochondrial damage and fragmentation. Herein, we investigated the molecular basis of pα-syn*-induced toxicity. By immunofluorescence, we found phosphorylated MKK4, JNK, ERK5, and p38 MAPKs in pα-syn* inclusions. pJNK colocalized with pα-syn* at mitochondria and mitochondria-associated ER membranes where it was associated with BiP and pACC1, markers for the ER and energy deprivation, respectively,” write the investigators. “We also found that pα-syn* aggregates are tightly associated with small ptau aggregates of similar size. Pα-syn*/ptau inclusions localized to areas of mitochondrial damage and to mitophagic vesicles, showing their role in mitochondrial toxicity, mitophagy induction, and their removal along with damaged mitochondrial fragments. Several MAPKs may act cooperatively to phosphorylate tau, notably JNK, p38, and GSK3β, a non-MAPK that was also found phosphorylated in the vicinity of pα-syn*/ptau aggregates. Parkinson’s can have many causes, from genetics to environmental factors, but a protein called α-synuclein (α-syn in short) is found to turn bad and form clumps in every case. The Lasmézas lab has discovered that a particular type of α-syn aggregates called pα-syn* starts to show up around mitochondria. This is a big problem for cells, which need mitochondria to produce their energy. The new research shows that pα-syn* damages mitochondria by starting a cascade of events. First, pα-syn* activates the MAPK pathway. Enzymes of the MAPK pathway then modify the protein tau. Tau is known to form tangles inside neurons in the brains of Parkinson’s disease patients. But scientists did not know how they got there or what they were doing. The Scripps team found that enzymes of the MAPK pathway modify tau via phosphorylation. This version of tau then clumps together with pα-syn* on the mitochondrial membrane. The two protein aggregates grow bigger and bigger, destroying the mitochondria in the process. “We’ve shown how pα-syn* works as the main trigger in mitotoxicity,” said Dr. Lasmézas. Study first author Diego Grassi, Ph.D., a research associate at Scripps Research at the time of the study, stressed the importance of discovering tau’s role in destroying mitochondria. Scientists know tau is involved in Alzheimer’s disease, so this study suggests a mechanism behind how Alzheimer’s and Parkinson’s overlap at the molecular level. The presence of α-syn and tau aggregates is also a telltale sign of other forms of dementia, and now scientists know how this might occur. 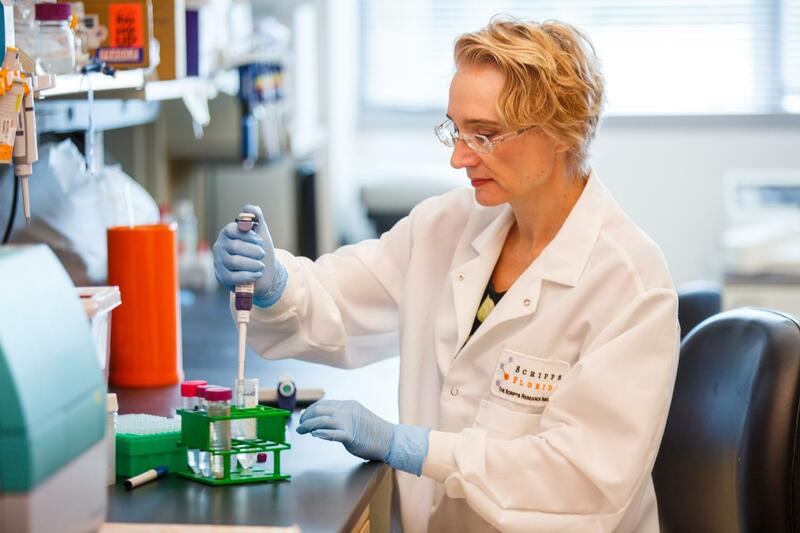 “This is also important for its possible implications in other neurodegenerative disorders,” noted Dr. Grassi, who adds that the next step in this research is to study how to stop pα-syn*, with the ultimate goal of treating Parkinson’s disease.